This is the new book from the Campbell family. Four women from one family (three generations) offer wisdom woven from threads of deep faith. For 100 days, three of us write a message to you from our hearts. Nancy Campbell writes as the grandmother; Her daughters, Serene and Pearl (Trim Healthy Mama) as the mothers, and then 19 year-old Meadow, the granddaughter. I know you will be blessed. These devotions are for the whole man--body, soul, and spirit. You will receive food for your soul and spirit and also encouragement in being a trim healthy mama. A blessing for yourself and a beautiful gift for someone else. 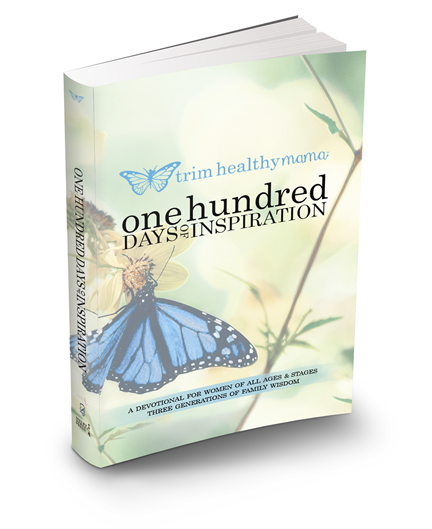 "100 Days Of Inspiration - PDF - EBook Format"
They make wonderful gifts that will keep Encouraging, Strengthening, and Inspiring in your Divine Call to be Wives and Mothers. NOTE: You will receive and email with a download link for this product that will be good for 14 days from purchase. You will need to download this file to a computer and then transfer the .pdf file into your ebook reader. Here's our 100% Satisfaction Guarantee... Order your Electronic Book (E-book) file(s) today. Examine the contents for a full 30 days. If after examining the MP3 you feel that this material is defective, call us and tell us you’d like to receive a replacement E-book file. We’ll send you a new Electronic Book (E-book) file(s) right away. You may request a store credit refund within 30 days of delivery. Since this is electronic media that is easily copied, we will not issue a money refund for merchandise. Click the button below to add the 100 DAYS OF INSPIRATION - THREE GENERATIONS OF FAMILY WISDOM - EBook Format to your wish list.